Here's a good use for some of that tasty extra-virgin olive oil. Homemade pasta is just so good and it's been awhile since I've made it. I'd never tried orecchiette and I decided to pair that with roasted Brussels sprouts, a new favorite in our house. 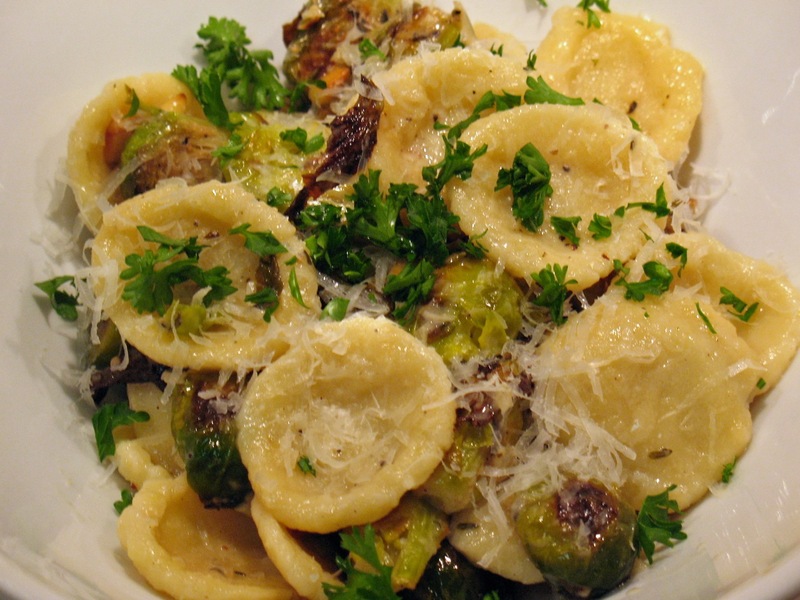 Their relatively similar sizes complement each other nicely, with the orecchiette often cupping caramelized pieces of sprout. Another goal was to make a really good vegetarian entree. I'm not vegetarian, but I have plenty of friends who are, so I want to feature vegetarian dishes from time to time. It was tough with this one though. Lots of similar recipes call for bacon or pancetta. Even a vegetarian I asked for advice about possible additional flavors suggested pancetta. I stuck to my plan though and rounded out the flavors with some toasted pine nuts, thyme and pecorino romano, a good sheep cheese alternative to my usual parmigiano-reggiano. Making pasta from scratch is not hard and the results are so brilliant. For this, I consulted Mario Batali's Food Network recipe. Instead of blending two flours, I used Hodgson Mill pasta flour, a blend of semolina flour and durum wheat flour. In the past when making pasta, I used recipes that called for eggs, but I tried it out without this time and it worked fine. When mixing the flour with the water, I started with just over a half a cup of warm water and then added additional water 1 tbsp at a time until the dough came together. The next step involved some muscle: kneading. I kneaded the dough for 8 minutes. It made me respect those old Italian ladies you know do this every day. The dough is ready when it's smoothed out a bit elastic. Let it rest for awhile before shaping it. The dough should be shaped into ropes about 3/4 of an inch thick (the Batali recipe says 3 to 4 inches which is surely a misprint, that would make HUGE orecchiette). Work it with your hands to thin it out and then roll it on the pastry mat to even it out. 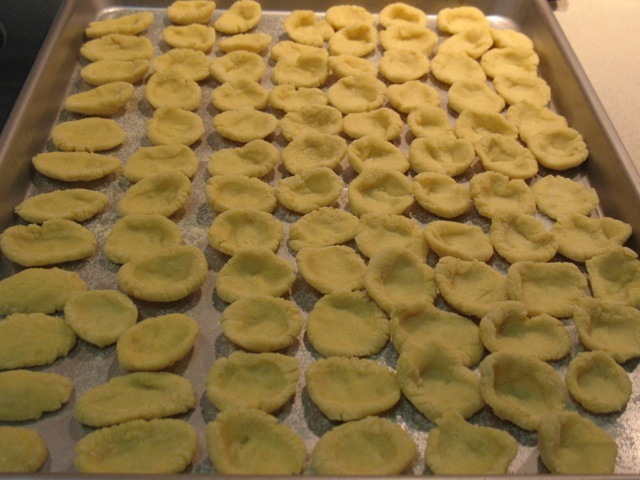 Forming the orecchiette takes a little practice. Notice how the ones on the left are a bit oblong. I figured out that since the cutting squishes the dough down, you need to reshape it a bit before smashing your thumb into it to make the little hat shape. It worked best for me to press my thumb in and then turn the dough inside-out while squeezing the edges to make sure they aren't too thick. I'd love to be able to do it like this. Prep the sprouts for roasting by cutting off the tough root end, removing any dark outer leaves and slicing them in half. Line a baking sheet with aluminum foil (to make clean up easy), toss the cut sprouts with olive oil, salt and pepper and stick in the oven when it's hot. I roasted these for 35 minutes, stirring them after 20. They were already fairly browned at 20 minutes, but I wanted them to be really dark and sweet. The extra time paid off. For the sauce, I was concerned about under saucing the pasta after the orzo I made was too dry. But I didn't want to overwhelm the sprouts either. I decided against garlic for that reason, but I substituted a healthy amount of shallots--about 1/2 cup minced--to provide some subtle onion flavor. I used extra-virgin olive oil for the base. The white wine (I used chardonnary) and thyme added some more flavor while the cream thickened it a bit. I shredded the pecorino with a microplane, so you might not want to use a full cup if you use a coarser shred. 1. Adjust oven rack to upper third and preheat oven to 400 degrees F. Line a baking sheet with aluminum foil sprayed with olive oil. 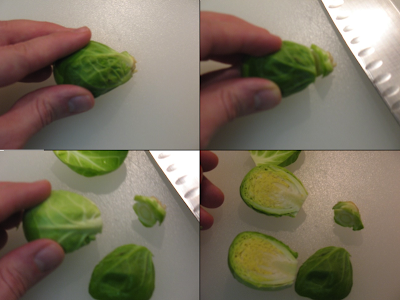 Cut off root ends of sprouts and remove dark green outer leaves. Slice sprouts in half. Add to large bowl and toss with 2 tbsp olive oil, sea salt and fresh-ground black pepper. Spread evenly on baking sheet and roast until sprouts are browned, about 35 minutes total, stirring a bit after the first 20 minutes. Set aside. 2. Toast pine nuts in a small saute pan over medium-low heat until fragrant and lightly browned (be careful not to burn). Set aside. 3. Heat 2 tbsp olive oil in a large saute pan over medium heat. Add diced shallots and saute until soft but not yet brown. Add white wine, cream and thyme to pan. Once hot, add cheese and reduce heat once melted. Season with salt and pepper to taste. Reduce heat to low until pasta is done. 4. Heat a large pot filled 2/3 full with water and generously salted over medium-high heat until boiling. Cook pasta in two batches until al dente (pasta will float to the surface and plump a bit when done). Remove pasta with slotted spoon. Reserve 1/2 cup cooked pasta water. 5. Add pasta water, Brussels sprouts and pine nuts to shallot sauce and increase hit a bit to rewarm. Toss with cooked pasta. Serve in bowls topped with some more shredded pecorino romano and chopped parsley. 1. 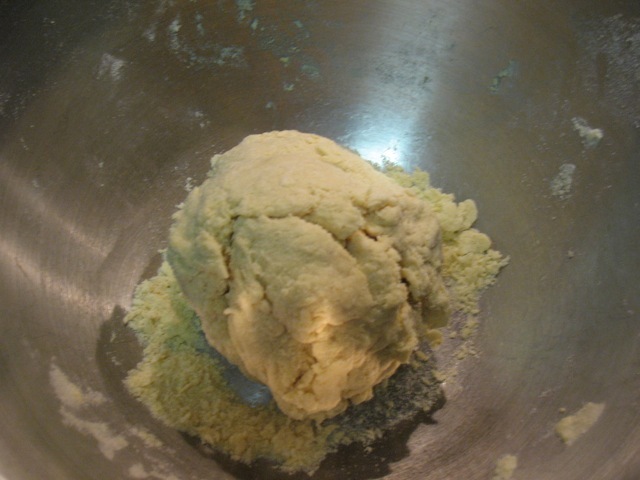 Add flour to large bowl and make a well in the center. Add water slowly, stirring to incorporate. Work dough with hands until it comes together. Add water, 1 tbsp at a time if the dough won't come together, but be careful not to use too much water. 2. 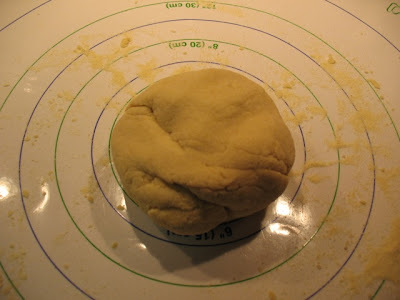 Put dough ball on floured surfaced and knead for 8 minutes until smooth and elastic. Cover with loose cloth and set aside about minutes or until ready to use (it can be refrigerated overnight at this point). 3. 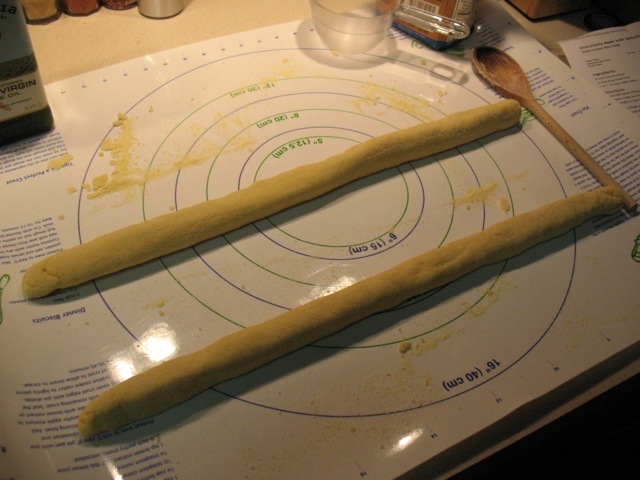 Using your hands, divide the dough in half and roll into two long ropes 3/4 inch thick. Cut ropes into 1/4 to 1/2 inch pieces. Press your thumb into the center and then invert the dough to form a cap while squeezing the edges to make sure they aren't too thick. 4. Place pasta caps on a floured baking sheet and cover with a cloth until ready to use. This looks DELISH. Love Brussels sprouts! Thanks! It was good. We're really into Brussels sprouts these days.